Google has been in the acquisition business since 2001, enhancing its portfolio over the years and bringing better products to its users. Per Wikipedia Google has acquired about 140 companies till date- both small and big, including a few startups as well. 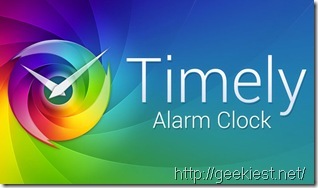 Google’s latest and the first acquisition of 2014 is a quite popular Android application named Timely - an Alarm Clock. The Switzerland based “Bitspin” company- the developer of “Timely”- recently posted a ‘good news’ on their official site announcing that Bitspin is joining Google, and assured that “For new and existing users, Timely will continue to work as it always has”. Timely- a stylish alarm clock app uses cloud integration to backup and synchronize your alarms with multiple devices, not to forget its gorgeous interface. With high quality sounds and Smart Rise alarm mode, it makes sure that you wake-up in a good mood. The user experience is further enriched by allowing one to customize the interface per one’s taste. Furthermore, Timely has a 4.4/5 rating on Google play and boasts with downloads ranging between 1 million to 5 million. So, it’s now time to try it out. While Timely’s future is yet to be known due to lack of any further details as to what Google wants with Bitspin, we have some good news to share. Formerly coupled with advertisements and in-app purchases, Timely, post acquisition announcement has gone completely Free. All premium contents such as sounds, themes, and challenges which were to be bought though in-app purchase, are now been provided free. So head over to Google Play and grab your copy of Timely, before it’s too late and Google changes its mind to drop the app, as there are speculations that Google might integrate Timely in upcoming Android version.